There is so much to celebrate! Many of you know that my wife and I just had our fourth child. Each child has brought different emotions -- nervousness with the first, overwhelmed with the second, confidence with the third, and happiness with the fourth. I am so thankful for the craziness of my life. However, to survive the craziness I must celebrate -- even the smallest of accomplishments. My wife and I celebrate with a sigh of relief after attending a church service without any major disruptions. We celebrate with a free minute to talk when all the kids are playing together in the basement. And we celebrate with cups of coffee after getting everyone into bed without tears. Today we celebrate four things; a wonderful author and librarian, a book that has been one of our family's all-time favorites, a new book that taught us so much and a milestone for Happy Birthday Author. Wendie Old is a retired children's librarian that spent over 30 years helping people find the "best books" in the library. Her career as a librarian led her to become a children's author. She described becoming an author during an interview with Ravenstone Press, "My first published picture book came from a search by a parent for a book to help her child understand the death of a baby with S.I.D.S. I was unable to find a publisher until I received a catalog at work which seemed to have a lot of similar books in it. Ah Ha, my little brain deduced -- this might be a possible publisher. So I sent it to Albert Whitman and they published it." 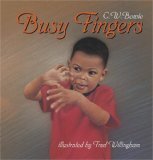 Since then, according to her SCBWI page, she has published 45 books including biographies for middle-schoolers and one of my favorites books to read to my children, Busy Fingers, under the pen name C.W. Bowie (C.W. Bowie is actually three people - Wendie Old, Mary Bowman-Kruhm, Claudine Wirths). Wendie Old also will now have the special distinction of being the 150th author celebrated on Happy Birthday Author! Busy Fingers has been a book that I have read to my three oldest children countless times. It has been a "must read" board book (which I now own in hardcover too!!) before nap time for each of them at some point in their lives. I am awful at memorizing lines, but I know this book by heart. It starts, "Fingers high, fingers low. Fingers reach to touch a toe." I love it! This book, for sentimental reasons, had to be the initial focus of our birthday celebration for Wendie Old. 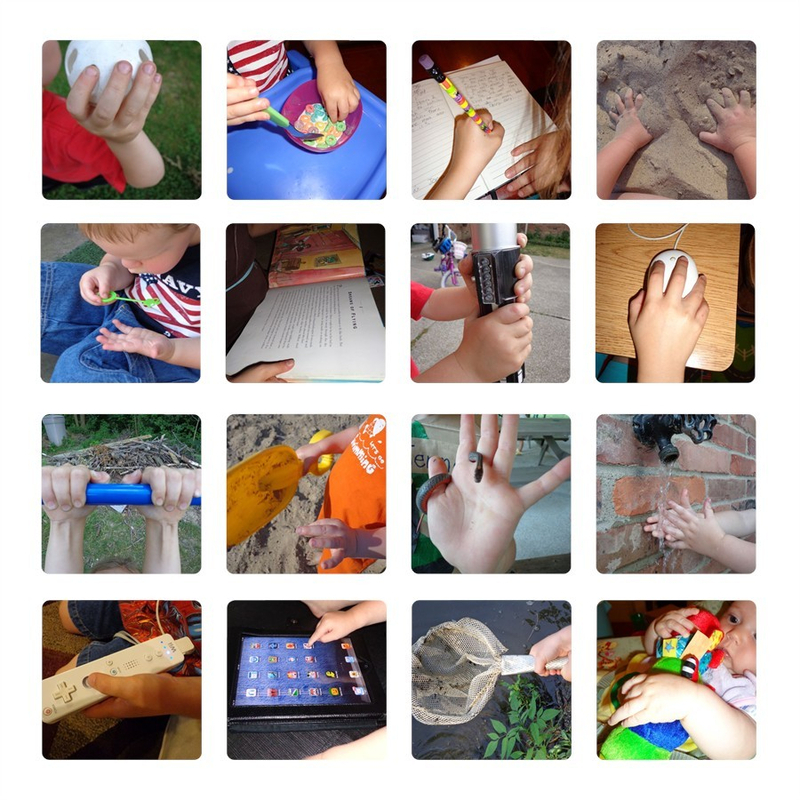 I thought it would be cool to have a collage of my children's "busy fingers" doing the things they love. I carried my camera with me all week to get some of the photographs. 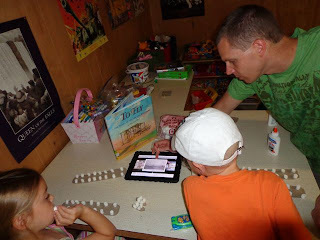 I also asked them to name some of their favorites activities -- iPad, Wii, reading books -- and we made sure we got pictures of those things too. Once I had all the images I uploaded them to the website, Picture 2 Life. The collage was free and easy to make. I was able to download the image which I printed at home. I was so happy with how it turned out that I think I need to have it professionally printed to frame somewhere in the house. Lots of busy fingers in our house! 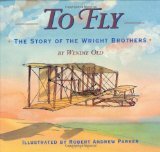 My children also really enjoyed reading To Fly: The Story of the Wright Brothers by Wendie Old and illustrated by Robert Andrew Parker. We read this picture book over the course of two nights since it is slightly longer than a normal picture book. 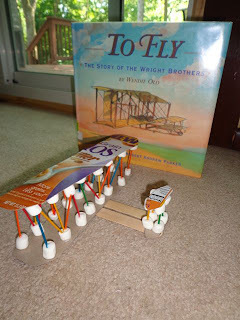 However, that did not stop us from enjoying the book and learning quite a bit about the Wright Brothers. We learned that the Wright Brothers initially experimented with kites to learn how to "control" flight. 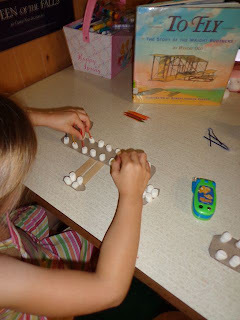 Our favorite part was learning that the Wright Brothers did not give up after having some early failures. They experimented with air flow and air pressure on over 200 different wing shapes. These experiments led them to the first controlled heavier-than-air manned flight on December 17, 1903. The flight lasted only 12 seconds and covered only a distance of 120 feet, but it was a success! My son said, "We need to build our own fliers!" 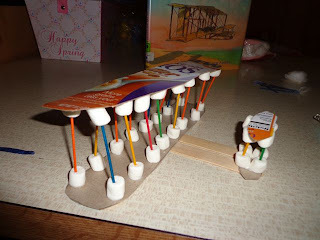 We made our very own Wright Flyer out of a cereal box, mini marshmallows, toothpicks, tongue depressors, and glue. I cut the top and bottom wings out of a cereal box. We set one on the table and put 16 dabs of glue evenly spaced on the piece of cardboard (8 on the top and 8 on the bottom). My children then placed 16 mini-marshmallows on the dabs of glue and then ate about 16 marshmallows! We repeated this for the other wing which would later become the top. Then we needed to make the front elevator. I cut two smaller wing-shaped pieces out of the cereal box and added four dabs of glue. 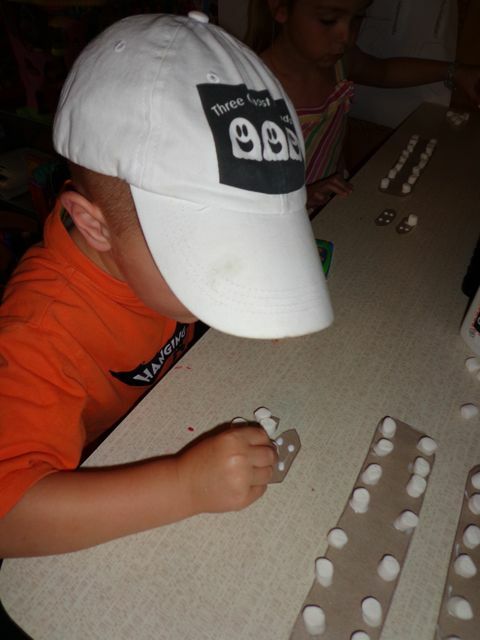 My children added the four mini-marshmallows and ate at least four more marshmallows. We repeated this for the top portion of the elevator. We investigated photographs of the original Wright Flyer to determine the best way to attach our elevator to the wings. We decided two tongue depressors would work well. We dabbed glue to on both ends of the tongue depressors and then pressed on the marshmallowed (I think I invented a new word!) elevator and wing. 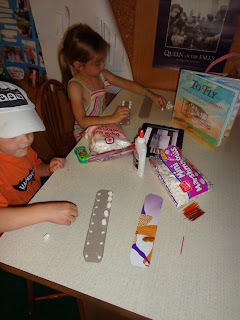 We waited for the glue to dry and then my children pushed a toothpick into each marshmallow. It is best if your place the toothpick as close to the center as possible. The trickiest part was adding the top wing and the top portion of the elevator to the toothpicks. It helped having two sets of hands to guide the toothpicks into place. Our flyer leaned a little so we added more toothpicks for support which you can see in the picture below. Once it dried it was pretty solid. Our Wright Flyers turned out pretty good. I am sure my son is going to test his flyer off the deck before long! I was born on Father's Day and was my parent's first child. My father was so excited, he quit his job and roamed all over Pennsylvania looking for a better one. He found a job with Sylvania and worked there during World War 2. I had my first airplane ride on my birthday when I was six -- a little piper cub plane. Tradition? I love coconut cake for my birthday! Thank you so much Wendie for sharing your birthday thoughts. We hope you have a wonderful birthday. Thank you to all of the readers of my blog and to my wife for proofreading every post! It has been an amazing two and half years of experiencing books with my children and meeting so many new friends online. I have learned so much from the 150 authors we have celebrated and their books. I have had many late nights of "busy fingers" typing the posts for you to enjoy, but it has been worth it! Here's to many more! So much to celebrate! What a wonderful family attitude also, to celebrate the small a log with the big. I just love that collage and you sure should have it framed! I confess that I haven't read many board books but I do love "To Fly" by Wendie Old. Happy 150th celebration on the blog, too. Here's to many, many more. Thank you Joanna! Thank you so much for being a consistent reader of my blog! I LOVE that you do all these activities with the kids. Love it! And congrats on baby #4! Love the pictures! That plane is awesome! Happy 150th! (My birthday is July 6th... ;)Following your blog, now. 150 authors??? I sit here in absolute amazement. Thank you for the work you do to engender a love of reading - not only for your own kids but for all kids. Congratulations! Thank you Julie! I very much appreciate your comment! Means a lot to me. That plane is the coolest & craftiest thing!! Congrats on the 150 celebrations you've done already Eric! Thanks Jennifer! I was so happy with how the fliers turned out. I was a little worried when they were leaning so much. However, they turned out pretty solid with the extra support toothpicks and drying overnight! Wonderful! And you bring us all so much with your blog! Congrats on the 150th and happy belated dad's day! Thank you Susanna! Thanks for being one of the 150! Thanks for the Father's Day wishes too! I love the Flyers that your children made. 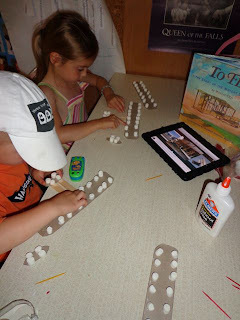 Marshmallows -- YUMMY! Thank you for including me in your wonderful blog. Happy Birthday Wendie! Thank you so much for participating by sharing your birthday thoughts. I hope you have a wonderful day!